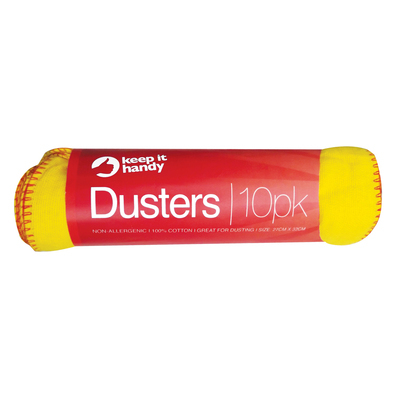 Suitable for the quick and efficient removal of dust around commercial and domestic establishments, our Dusters Yellow 10 Per Roll is an essential tool in your cleaning kit. Made from a soft textile material, these traditional cloths have contrasting red stitching around the hem to reduce fraying. Used either on their own or in collaboration with your chosen furniture polish, this pack of 10 dusters can be easily stored away in a dry cupboard until required and promises to leave no residue on your furniture. Browse our range of Furniture Polish to find the one most suited to your specific requirements or take a look at our Dusters with Handles for those tall ceiling or hard to reach furniture tops.